My second day in Ulsan wasn’t as action packed as the first day, but I did manage to have some McDonalds and pay a visit to neighboring Gyeongju. The only real food highlight of the day was when I managed to try a new type of 호떡 or hotteok which is like a sweet pancake. 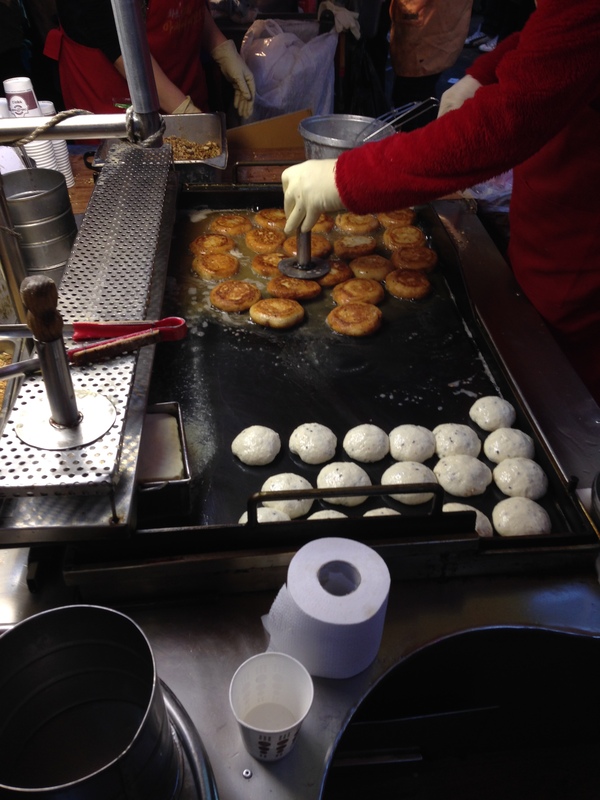 Normally, they are fried and filled with a sticky, sweet syrup, but the variant in Ulsan I found to be more pleasant. 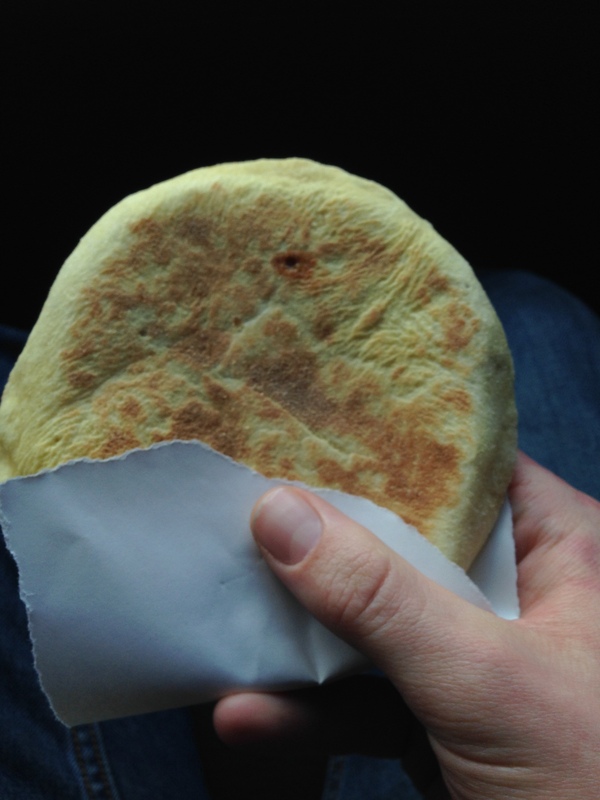 First, instead of being soaked in cooking oil, they were baked in a small oven. Second, inside the hotteok there were more sesame seeds and honey instead of syrup which led to a more interesting and varied taste. 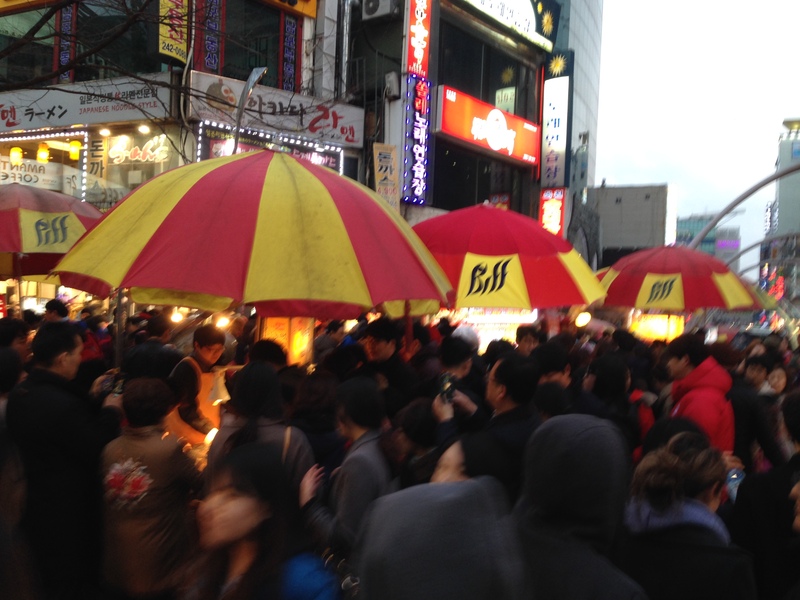 Plus, it wasn’t as messy as the original hotteok I tried in Myeongdong in Seoul. Lord knows I don’t like to have half of my food still on my hands when I finish eating. I made it to the seaside town of Busan. I had visited the city before where I tried some deadly fish soup and had a “sexual” encounter in the Jagalchi fish market, but this time we were going to explore the art village on the other side of the harbor. 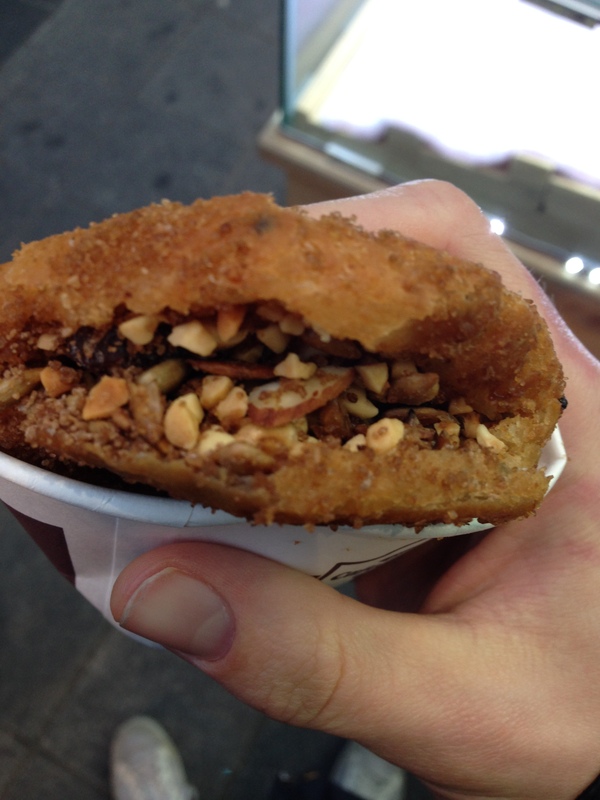 The first food I tried in Busan when we got to the art village was this Dalgona cookie that smelled pretty good from far away. However, this was no ordinary snack. I saw people fiddling about with their cookies on metal plates for some reason, so I learned hat you can cut out the shape imprinted in the cookie with a needle as a type of challenge. If you cut it out perfectly without cracking the shape, then you get a free one. Dalgona cookies seemed to be a simple treat to make since it was only made of sugar and baking soda that was heated to a high temperature before being spread on a small griddle where it cooled. You then got your choice of shape you could press into it. I decided to do a gingerbread man shape since it looked pretty easy…or so I thought. I took my seat next to the other kids at the table and proceeded to get to work. It was harder than it looked because the cookie was wafer thin yet extremely brittle which required the steady hands of a brain surgeon with the needle. I was making great progress as I cracked parts off around the upper torso, but a random fault line erupted as I rounded the crotch. All my hard work was for naught, and my Korean audience was disappointed after watching my splendid progress. I vowed to come back and try it again. 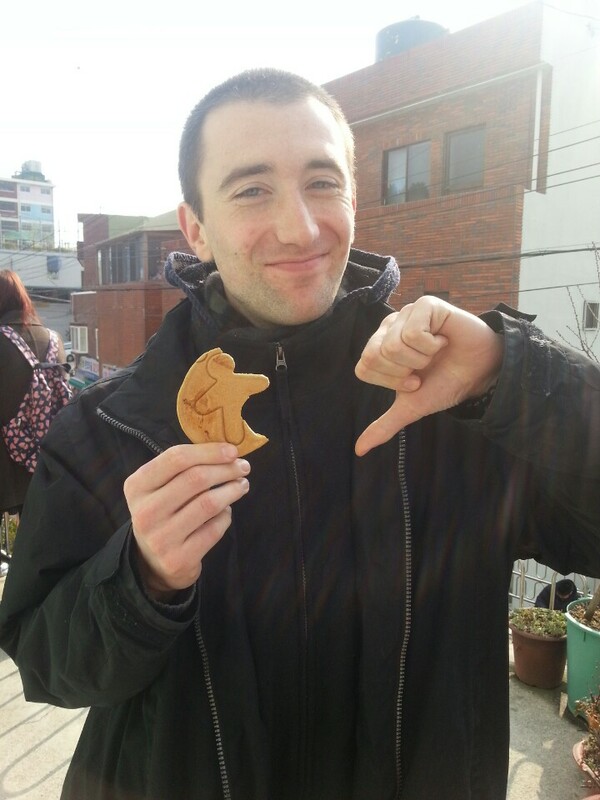 Even though the cookie was extremely sweet and crunchy, there was a burnt, bitter aftertaste that may have been caused by either the singed sugar or my defeat. I highly recommend a trip to the art village as it’s very quirky but tasteful if you like random artwork integrated into a mountainside community. On the way back to the car, I got another Dalgona cookie with a fish this time in honor of the seafood hub that is Busan. This time around, I cut the shape out with four quick jabs with the needle. I was satisfied with overcoming the challenge. 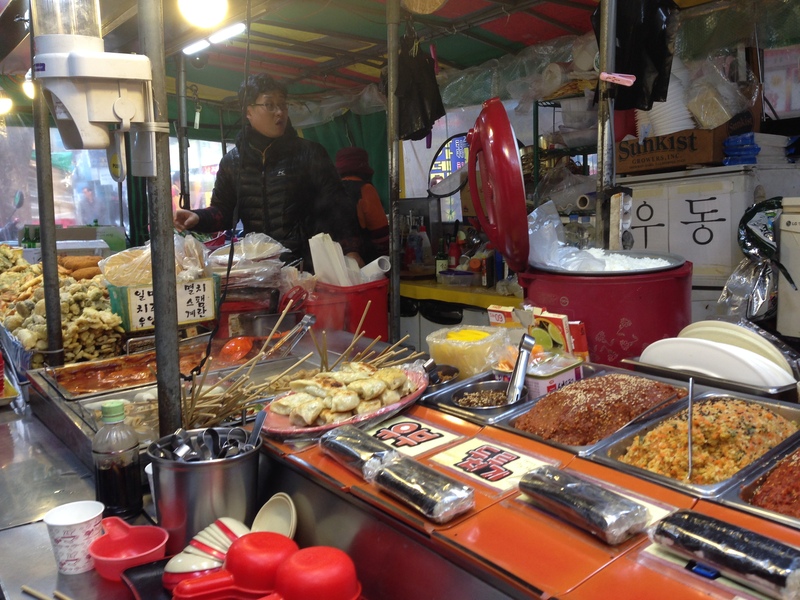 However, these snacks were a mere prelude to the food extravaganza that would soon follow in the city as I went to Gukje Market. 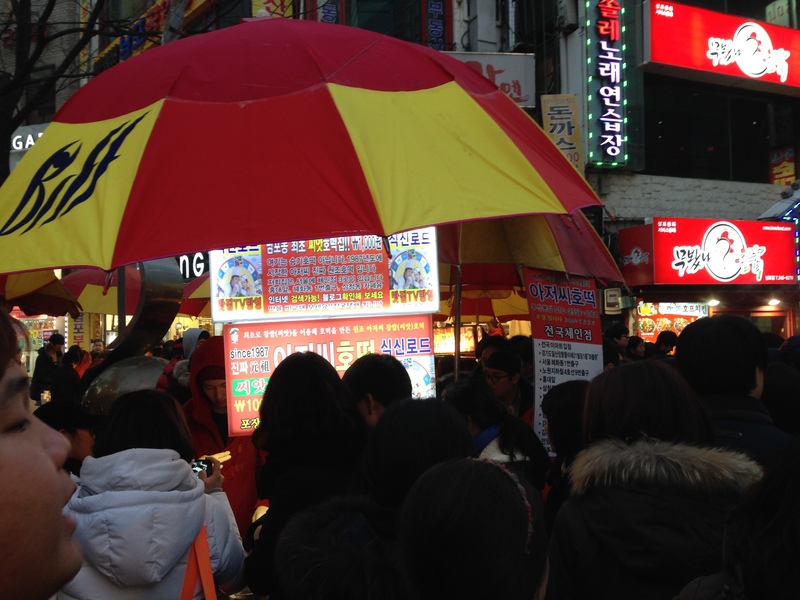 When we got there, it seemed like the entire world was out and crowded around these food carts. 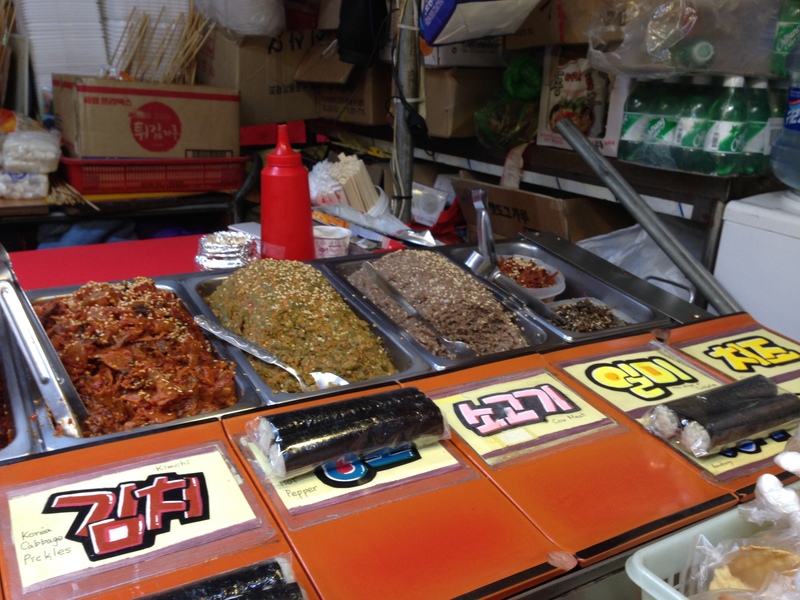 I would come back to these carts later, but first we had to try some of Busan’s famous mini kimbap (think California sushi rolls with different fillings). 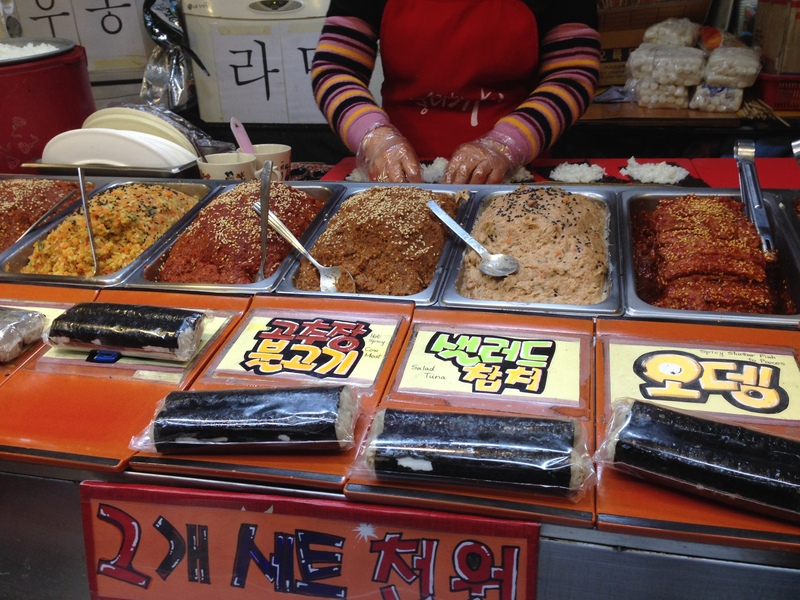 We went to a food tent that specialized in these mini kimbap, and there was plenty of variety in terms of ingredients we could choose. You ordered by placing plastic kimbap on each flavor tag, and then the woman behind the counter would whip them up in a jiffy. I was starving at that point, so we ordered almost all of the flavors. I saved myself for the parade of little rolls that made their way onto our plate which included the following flavors: spicy pepper, flying fish eggs, anchovy, spicy tuna, spicy pork, spicy beef, kimchi, and dried squid. I loved nearly all of them, but the spicy pork and spicy beef were the most disappointing. It was more like eating liquified, overly salty mystery meat puree in a sushi roll. Not my kind of dining experience. 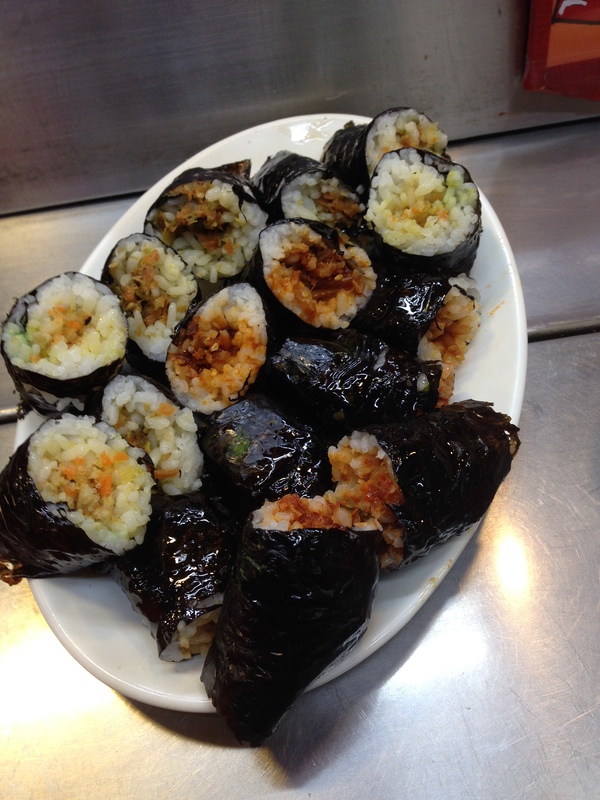 I really enjoyed the spicy pepper kimbap since they were spicy but filled with lots of pepper flavor. The flying fish egg kimbap were surprisingly good since the eggs brought a different texture to the rolls as I enjoyed popping the little orbs between my teeth. I eventually slowed down, but the food crawl didn’t end there. 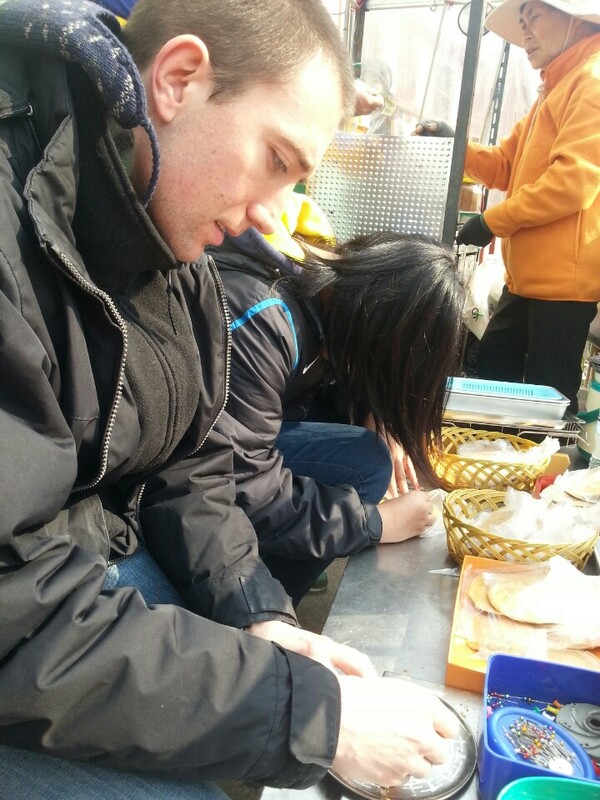 We then moved down the main pedestrian area of Gukje Market to get 납작만두 or napjak mandu which are essentially flat dumplings or potstickers that came with a side of 오징어무침 or ojingeo muchim which is strips of squid and vegetables in a chili sauce. 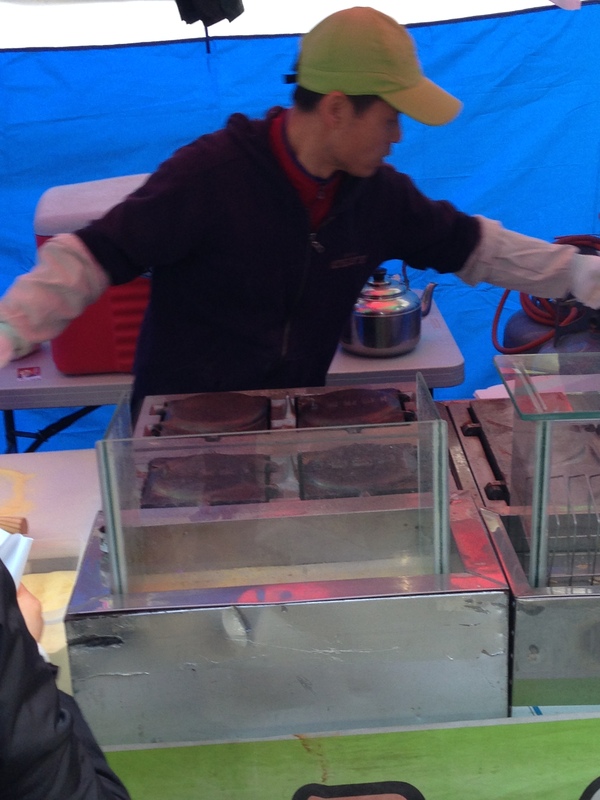 It was one of the many food carts that had a mob of people around it jostling for position to taste some of the wonderfully grilled dumplings, and I quickly made a hole in the crowd for us to stand. 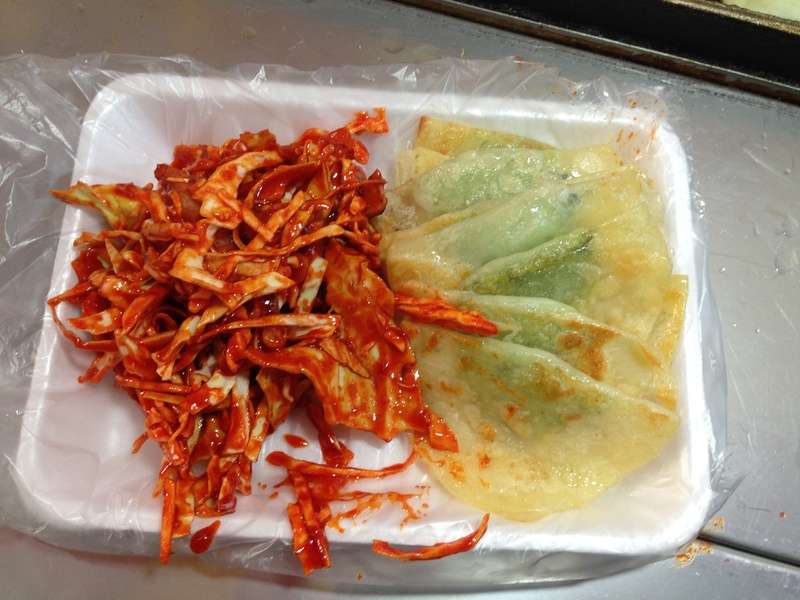 It seemed like people would put the vibrant red strips of squid and vegetables in the dumplings and then fold them like tacos to eat with chopsticks. 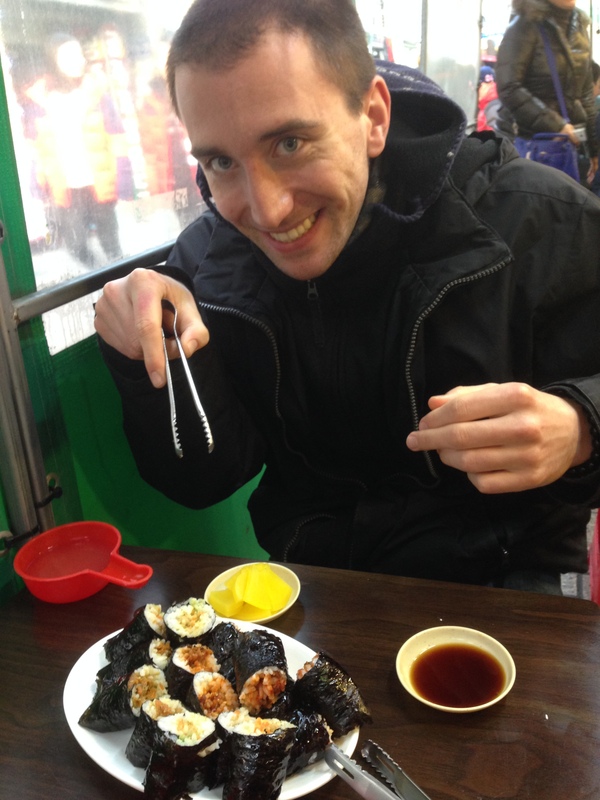 Overall, I would have enjoyed them more if I wasn’t so full of kimbap, but they were delicious. The dumplings were crispy around the edges, and the dough had a buttery taste that gave way to seasoned vegetables inside. Combined with the semi-sweet and spicy squid and vegetables melange, my palate was fully satisfied. As we made our way back to where we entered, I stopped for a quick drink at the convenience store. 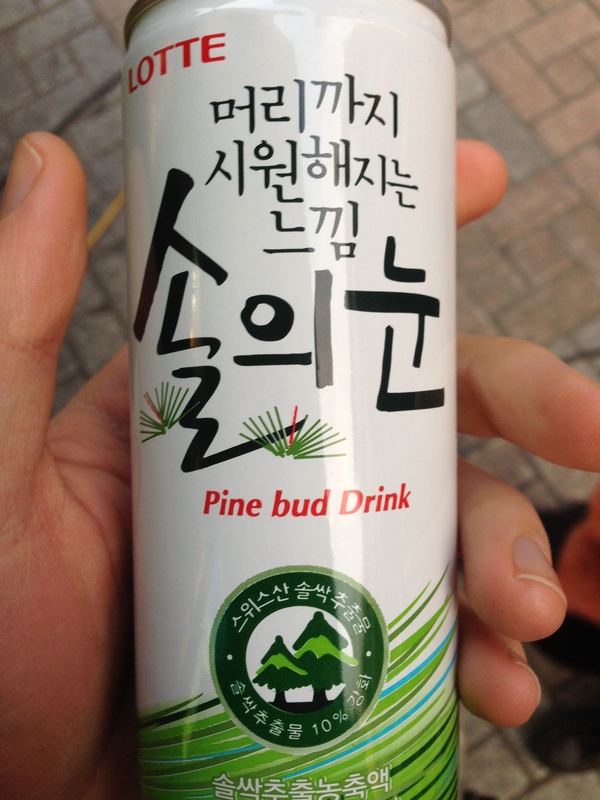 I saw a drink that was called “pine bud drink”, so I got it. 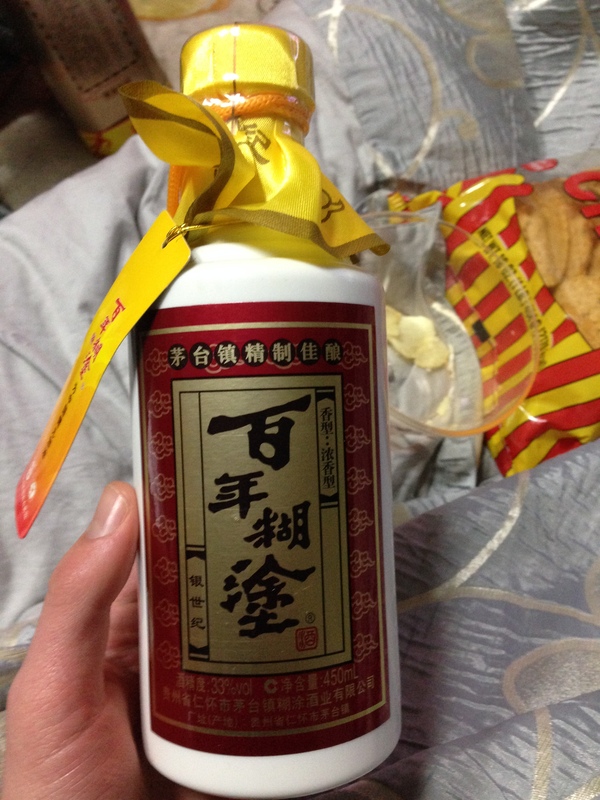 It apparently was made from pine tree needles, and the taste isn’t good. I took a big swig and was intrigued by the taste. It kind of tasted like Gatorade at first, but then I was blasted with a shot of a flavor I could only describe as pine tree mixed with menthol. Strangely, I enjoyed it for some reason I couldn’t quite put my finger on. 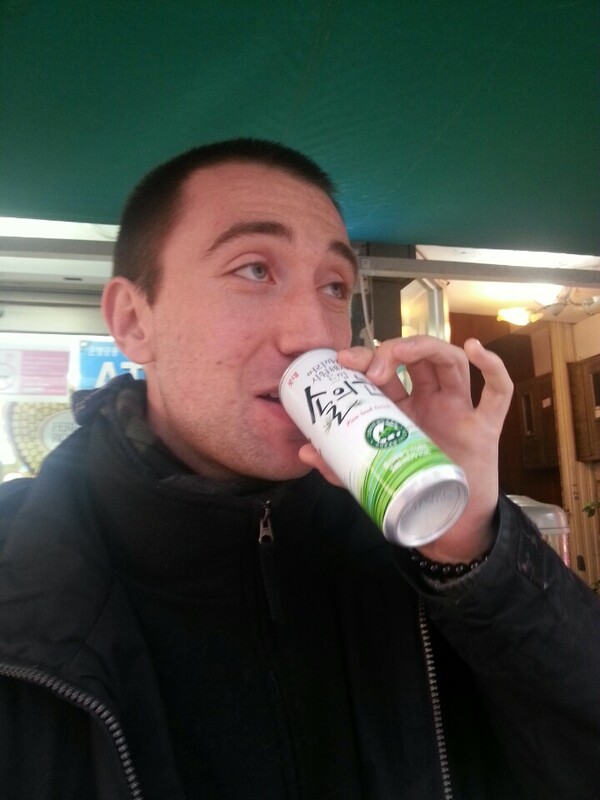 Then again I like green tea flavored products while my other foreign friends can’t stand it. Try it at your own risk. 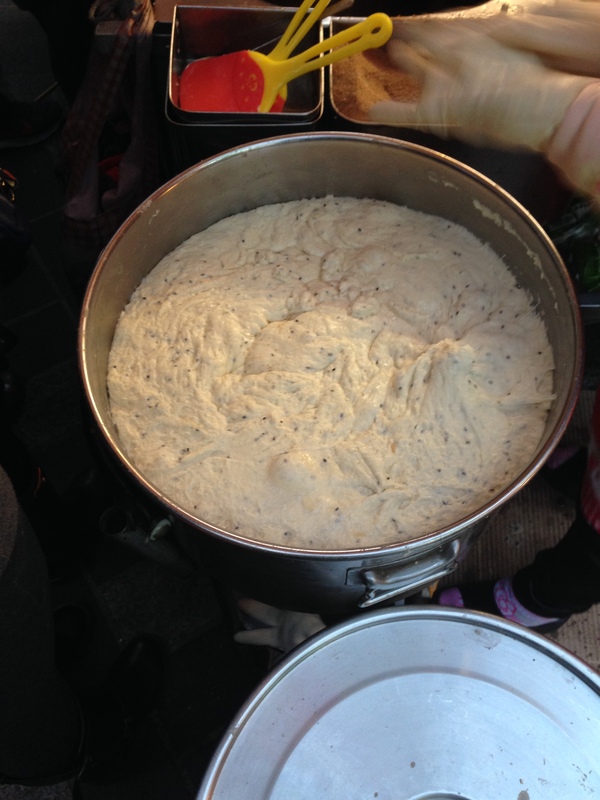 Finally, there was the 씨앗호떡 or ssiat hotteok or seed hotteok. We could only get it at the severely crowded entrance where we were quickly ushered in line by a guy working for the food cart. 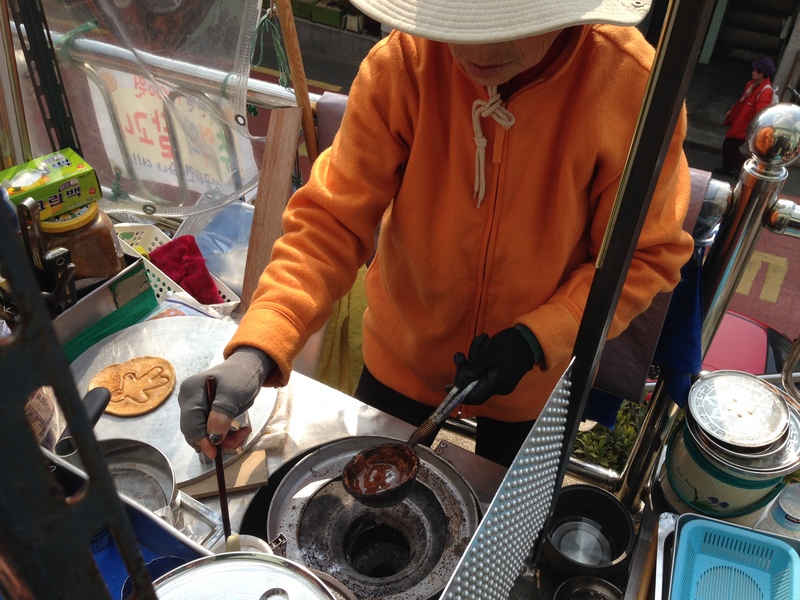 Apparently this is the original food cart that started serving the hotteok. It snaked around as more eaters rushed around us, and we eventually reached the front of the cart where the entire order and buying process took maybe 30 seconds tops. 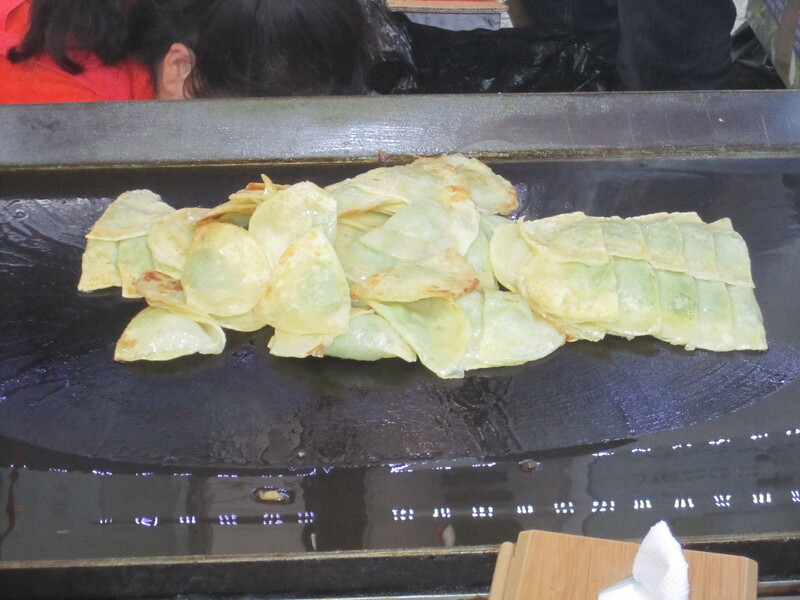 These hotteoks were fried like the ones in Seoul, but they were stuffed with honey, sunflower seeds, and pumpkin seeds. 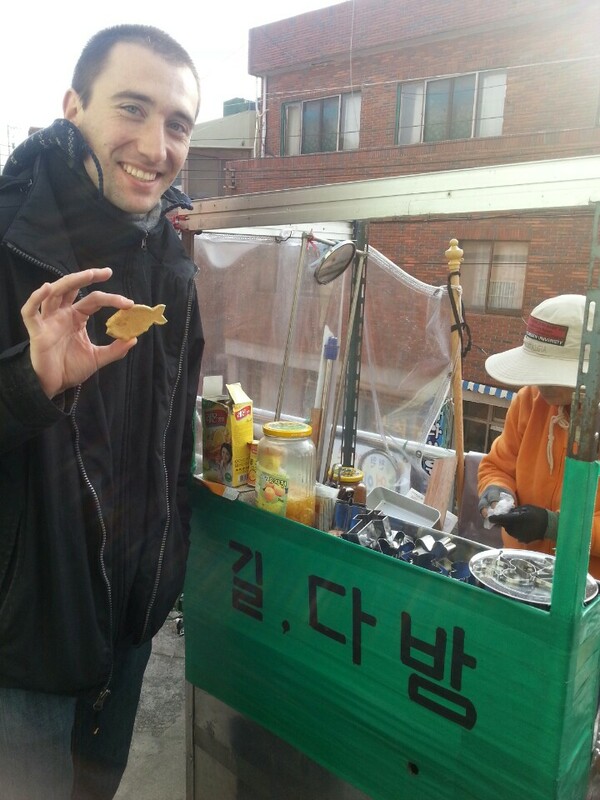 It was the best hotteok out of the ones I have tried. Not only was the dough chewy and rich, but the seeds made it taste like peanut butter when combined with the honey. Plus, I loved the crunchiness that served as a counterpoint to a mostly soft dessert. 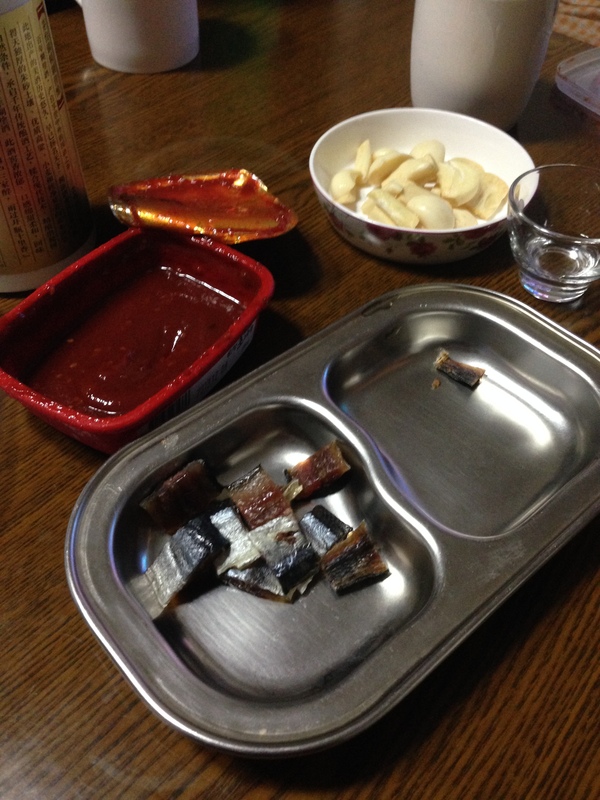 After getting back from Busan around 11pm, we tried some gwamegi or dried herring which is normally served with lots of side dishes to cut through the salty flavor, but we only really had chili sauce, garlic cloves, and some wonderfully strong and berry flavored Chinese baiju liquor. It was ok, but I did enjoy the smoky elements of the snack and the fruity aftertaste of the baiju which reminded me of my time in Beijing. We soon headed out for a late night snack of mayak jjimdak or drug chicken soup. Now don’t order this dish expecting to find some magic herbs and spices given the name. The “drug” element comes from the idea that the soup is so incredibly tasty that it’s addictive like a drug. 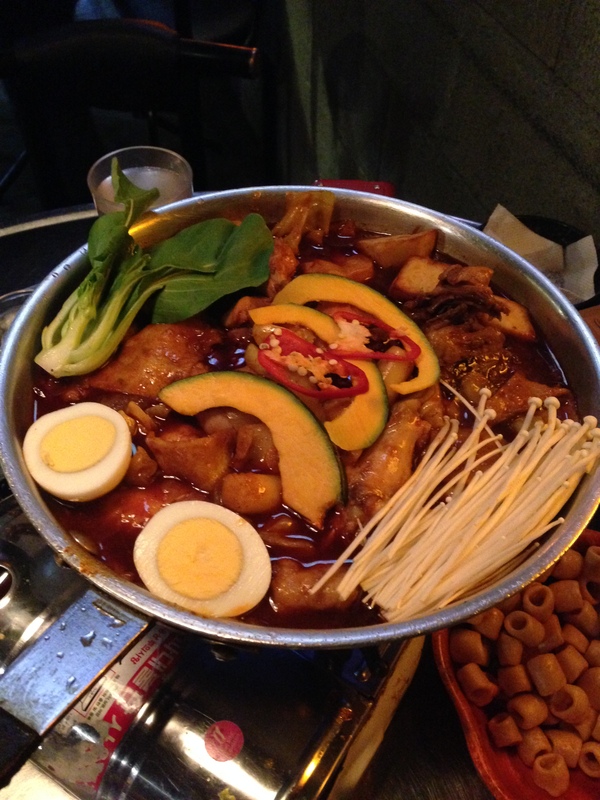 I would have to agree with them as the fiery red broth was thicker than a normal Korean jjigae or soup, and there were plenty of pieces of juicy chicken throughout the meal. I would have to check into rehab if there was a drug chicken soup spot by my house back home. 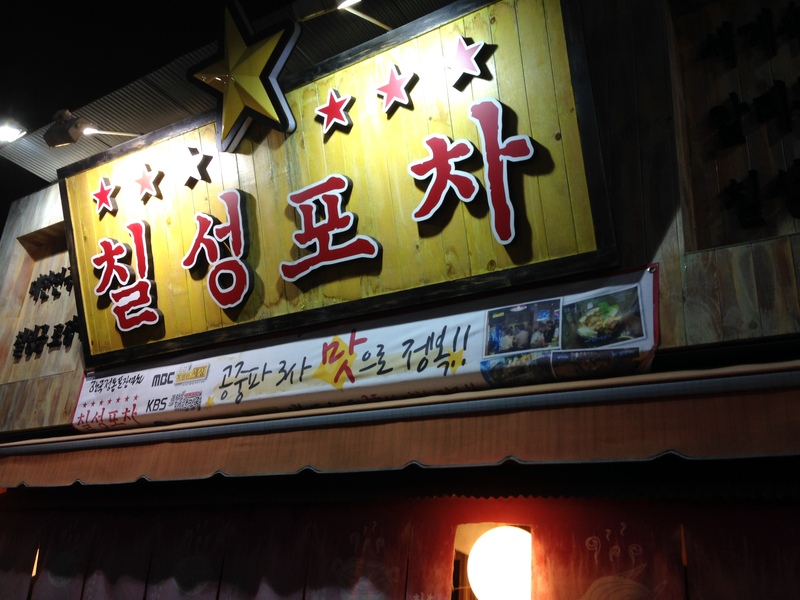 With that spicy and “illicit” meal behind us, my third day in Ulsan drew to a close. 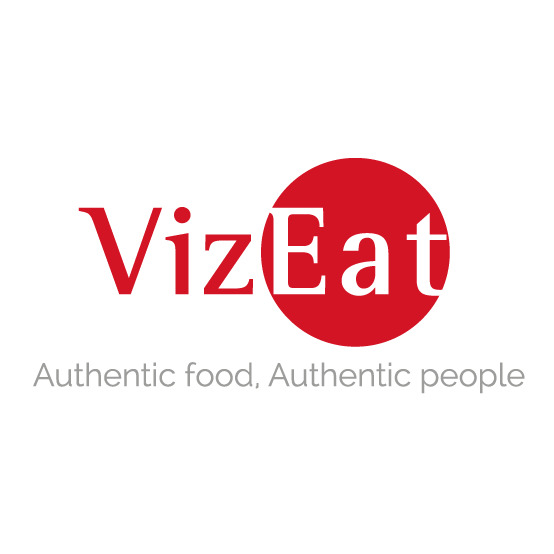 Posted in Alcoholic, Bakery, Beverages, Far East Asian Cuisine, Hard Liquor, Non-Alcoholic, Pastries, Snack Food, South Korean and tagged Busan, chicken, cookies, Dalgona, drink, hotteok, kimbap, pine, puzzle, seeds, soup, spicy, sweet. Bookmark the permalink.